One of the museums I was most looking forward to when working in New York this summer was The Whitney Museum of American Art. I had visited their old location on the Upper East Side, but had yet to see their new space. It did not disappoint at all. The striking building it is in, the view of the Hudson river from the location and the Whitney’s amazing collection and exhibitions made for a great visit (also the upstairs café is delicious if you get hungry). The Stuart Exhibition exhibition, on view until September 25, was both thought-provoking and pleasing to the eye. I loved the vibrancy and boldness of all the paintings and found the whole exhibition to be very uplifting- I spent a lot of time looking around. The exhibition explains how Davis looked to both avant garde painting as well as advertising (explained more here), and I think it’s really cool to see art that takes inspiration from other disciplines such as advertising. I found the exhibition to be both informative as to what was going on culturally at the time Davis was working as well as a mood-booster with all the color and fun patterns that one could find in the works. For more about the connection to the pop culture scene, check out Leonard Lopate’s interview with co-curator Barbara Haskell below. Learn more about the exhibition from Barbara Haskell. I found the works to be very abstract, but not so abstract that I couldn’t find my own interpretations of each piece. 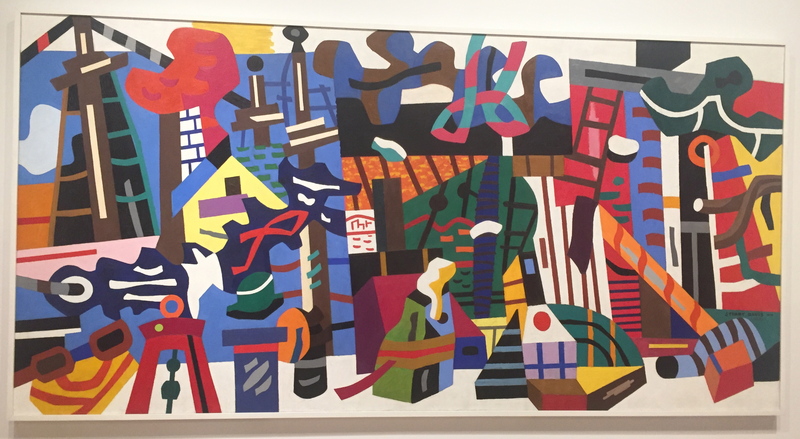 The combination of patterns and shapes on the surface of the works with the bigger connection to the changes in society made for a very engaging show. I love the way you have integrated the artworks into the overall post! I also love the use of your own photos in this of subjects other than the artwork to create a more interesting perspective. I wish you spoke a little bit more about the museum but an interesting read at that! Hi Jake, thanks for sharing your thoughts. I am glad to hear you liked the photos. And yes, I usually try to give more background information on the museum as I have done in other posts so I definitely agree with your suggestion. I think it’s cool how the first thing the viewer sees after clicking on the post is a big pop of color – it definitely pulls someone in. I was a little confused by the links because it looks like they go to the same page twice. It might have been cool to have one of the links go to a third-party that had also written about Davis, but overall a fun blog post! Thanks so much for the feedback! I definitely understand how the links to the same page could be confusing- I usually try to add a greater variety of sources within the links. Glad you liked the photo! I really like how you’ve used so many photos, both of the art, and of the building itself because the building is quite spectacular (although I do wish you had a photo of the view that you mentioned). Personally, I have mixed feelings about the Whitney, but now I’m curious to go back and check out this exhibit. Thanks so much for sharing your thoughts- I see what you are saying with the photo of the view.